Ansonia " HAGUE" with Porcelain Dial., circa 1900 Fancy Enameled Iron Case with no rust.. Case: Black Enameled Iron with decorative brass. 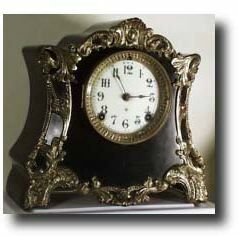 10 1/2" tall Works: Ansonia 8 day brass with hour count and half hour striking on gong. Reference: Ansonia Clocks by Tran Duy Ly Condition: Case: Excellent Works: excellent, runs great.